Everything I know about tot school, I learned from Nicole at The Kavanaugh Report. I've been admiring her fabulous tot school activities with Henry for months now and even stealing some ideas here and there to do with Ethan. I love to do projects and sensory activities with Ethan and I kept saying that I would begin tot school, officially and finally, but maybe next week. 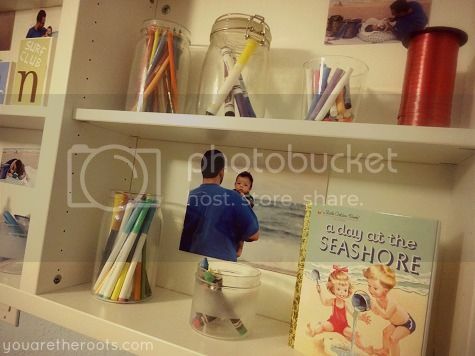 Last week, my husband came home from work and I was entranced by Nicole and Henry's tot school set-up and told him that there would be no more procrastinating: Monday, as in today, we would begin tot school with Ethan. I've been preparing all weekend and not without the endless guidance and enthusiasm from Nicole who was so gracious and helpful despite my seemingly never-ending pile of questions. 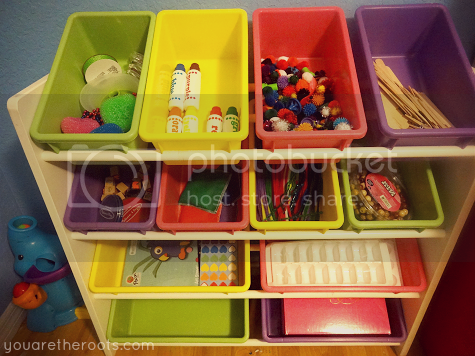 There were trips to the dollar store, to Wal-Mart, storage bins purchased on the cheap from a local parenting group. Last night, I stayed up well past midnight tearing my former office apart and piecing it back together as our tot school classroom. My former office. When we bought this house almost four years ago, all I could think about was having my own office. Having four bedrooms and it being only my husband and I, we each got our own office and there was still a room for guests to stay with us. 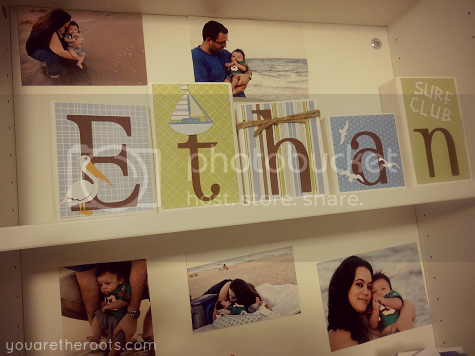 When I found out I was pregnant, it meant we lost the guest room and replaced it with Ethan's nursery. 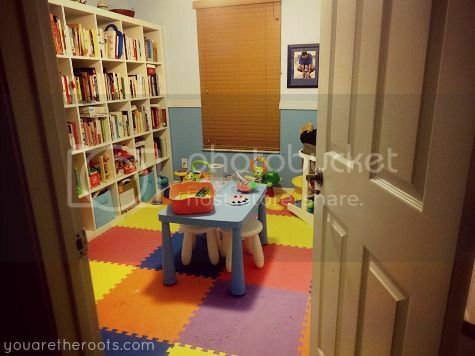 When Ethan arrived, I selflessly sacrificed my home office and insisted we'd turn it into a playroom. 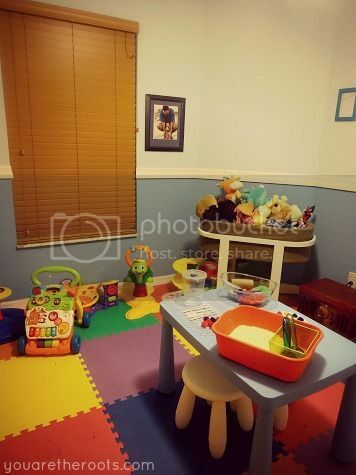 This was well and good except we never actually made the conversion into the playroom. I began to decorate it (I had chosen a vintage surf theme) but then over a year passed and the room has simply been a storage center. Yet after dripping buckets of sweat and a discovering a newly developed love for lamination, I am proud to reveal Ethan's tot school classroom! 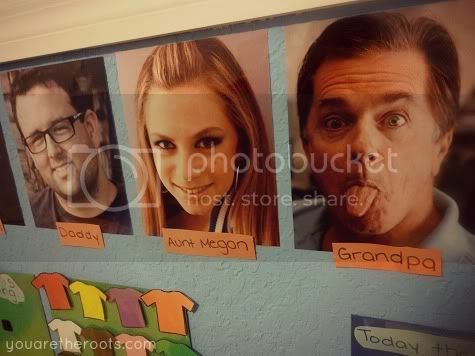 It features 8x10 photographs of our family members for Ethan to point out facial features. (Identifying the tongue is his favorite thing right now so my dad helped me out by making a fun tongue-sticking-out face for his picture!) I also included a weather wall as inspired by Nicole's. I'm excited about this because Ethan's classroom has a great window for peeking outside at the weather. 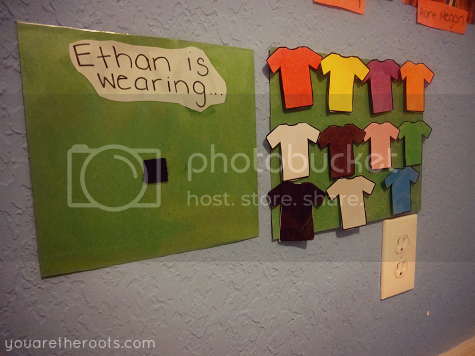 I also included a "Ethan is wearing..." sheet to help him learn to identify colors. We'll begin each tot school session by peeking outside to check the weather and comparing the t-shirt colors to what Ethan is wearing that day. I have three tot trays and a sensory bin set up for our first week of activities, which is what you see on the table currently. 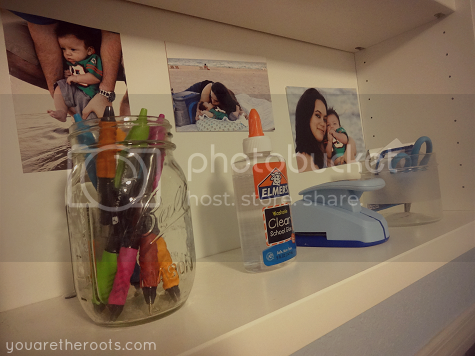 There is still a lot of empty wall space to work with (and empty frames hanging!) but I'll get it there, eventually. I don't have a designated reading area in our classroom because Ethan has an entire library in his room already which is where we do most of our reading.I'm pretty excited for how our classroom turned out and I am so excited (as in, couldn't sleep at all because I'm so excited) to begin this next chapter with Ethan. Hooray for tot school! I can't wait to get started! Looks great!!! I know you and Ethan will have so much fun learning and playing together. What a great idea! Eeeeeeek! I've been stalking you all day waiting for this! I love it!! It's so beautiful. 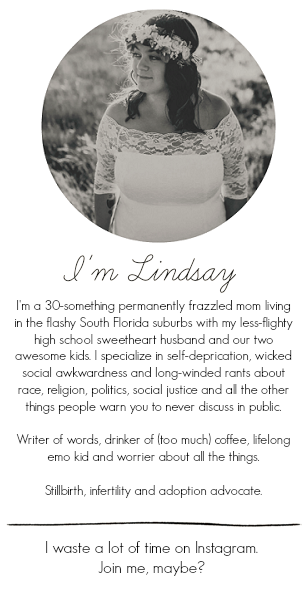 I can't wait to start "stealing" ideas from you! I think I'm going to start with the shirt color page! WOW! This is fantastic! Looks like all the hard work paid off- great job! it looks wonderful!! can't wait to read about all of Ethan's adventures in tot school!! 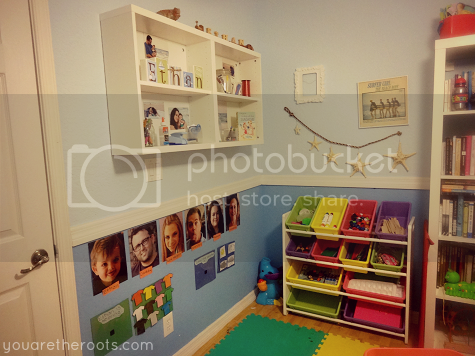 Great transformation from your office to playroom. 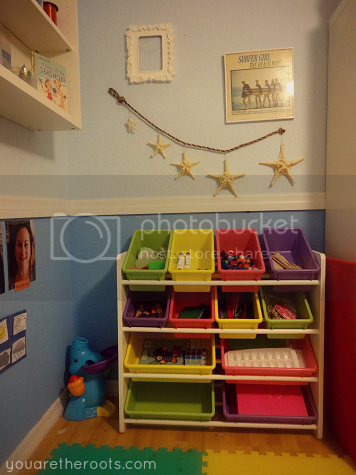 I love the colors you chose and the kid friendly toys, books and educational items. 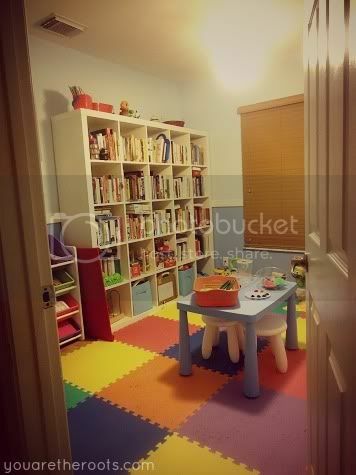 I wish I had a room like this for my kids but I just do not have the space. Cute! Love the shirt color idea...I may add this to our circle time! 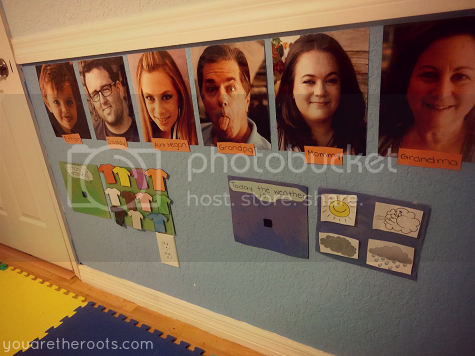 I have plans for a designated tot school room (also my old home office), and you may have just jump-started me! Thanks for sharing!